It's October, and this month is actually the National Breast Cancer Awareness Month. In order to raise awareness towards breast cancer, The Butterfly Projects is partnering with Pink Passion Saloon to raise breast cancer awareness. 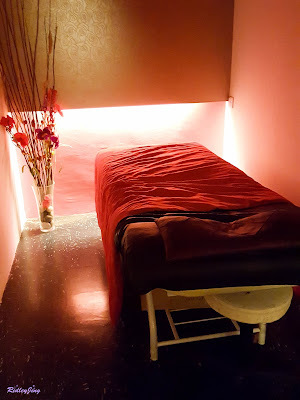 Thanks to them too, I got the invitation to review my lashes extension experience for the very first time at Pink Passion Saloon. 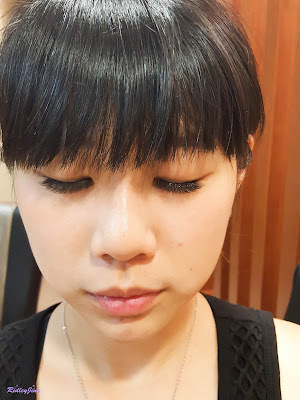 I was so so so nervous because I never did any lashes extension before, and I don't know how it will be and how it will turn out to be at the end. 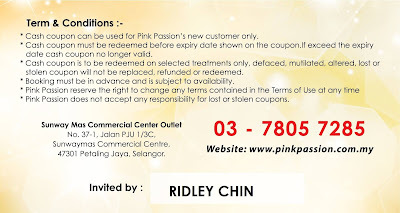 My boyfriend fetch me to Pink Passion because he's more familiar with the place. Their shop could be easily spotted when you are around that area because the shop was in pink color, which was very eyes-catching when you pass by it. The time I booked for the session was quite late in the evening, probably I'm their last customer on that day. Reached there on time and there's no waiting queue at that time, so it was my turn after I filled up some details form. This was where I got the lashes extension done on both of my eyes. 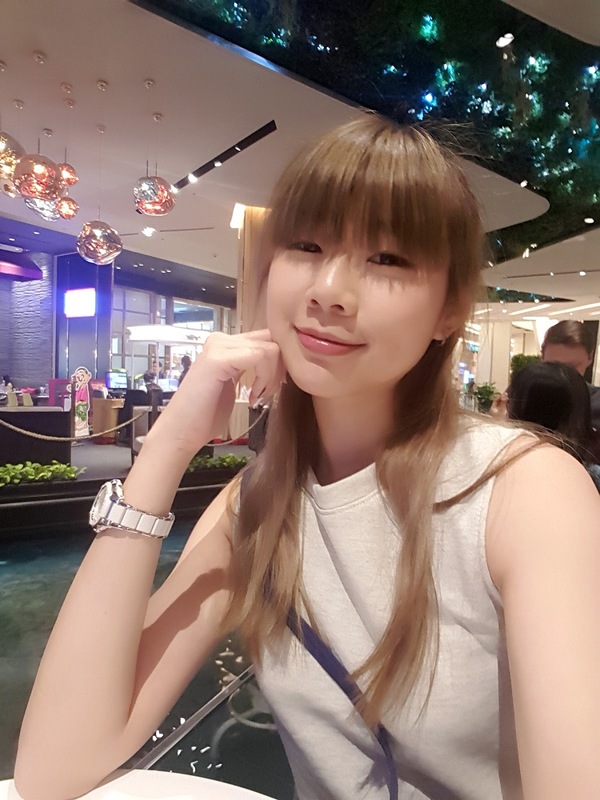 The environment was very nice and quiet, but a bit warm because I kept sweating, maybe I was nervous, lol. Since it was my first time having lashes extension, the staffs there gave me some suggestions. Well, I just agreed with what she said and then moved on to the lashes extension session. 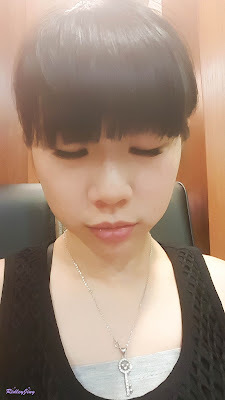 Since my eyes were closed for most of the time, I could not see anything, that is the main reason why I didn't even think of taking photo during the process of the lashes extension. However, the thing that I can let you know is that the whole process is not painful. At first I also thought that is it they will get rid of all my lashes and stick the new lashes for me? 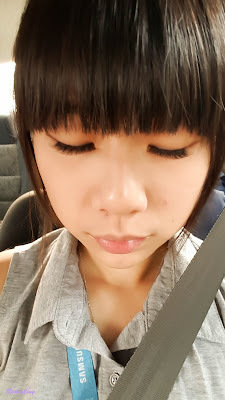 But when I browsed through their website then only I found out that my lashes will be safe. They will only extend the lashes with a longer fake lashes. Therefore, after the extension, you will notice that your one of your lashes will be supporting few extended lashes. I managed to take a photo of my natural lashes before the extension. According to the staff, my lashes are thick and black. 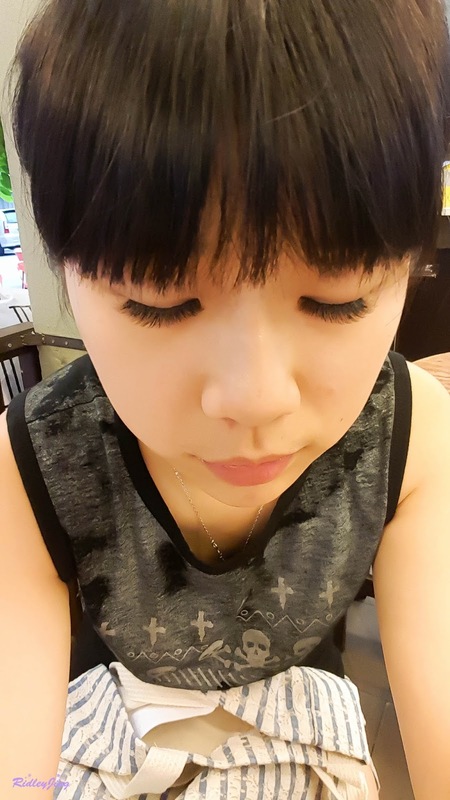 So they suggested me to do the medium length lashes, to make it looks more natural. After the lashes extension, my lashes were longer and darker. 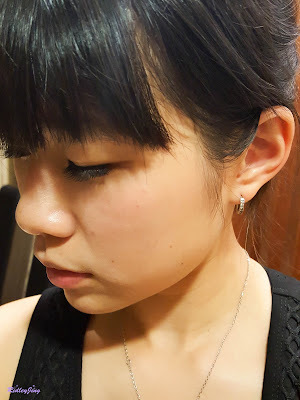 At first I was not used to it because it looks very dark, looks like I applied another layer of eyeliner. However, soon I just got used to it and fell in love with it because it is very pretty. This was took on second day while I'm on the way to work. Super in love with it and it went well with makeup. After gym also I took a lot of photos. The lashes were too pretty, I feel guilty for not taking more photos. Photo took after 1 week. Tried to took photos from different angles so you all can have a better look on the result. 1. Will you feel uncomfortable with the lashes? Not really. 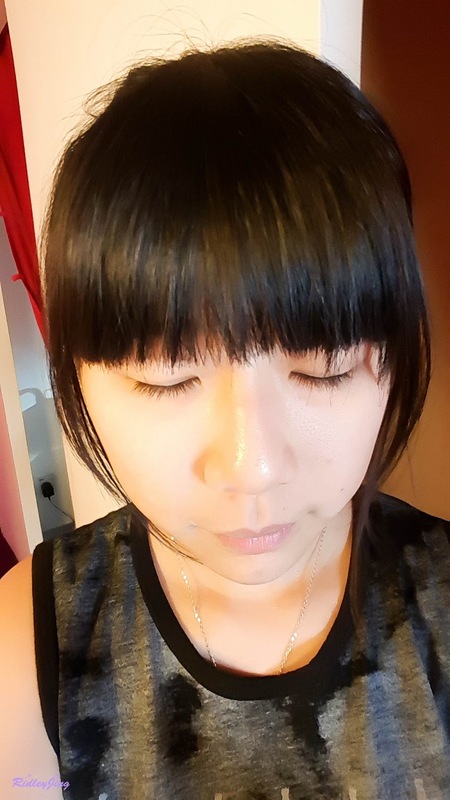 At first I might not used to it and felt a little bit heavy on my eye lids, but afterwards, I felt just fine. 2. How long does the lashes extension takes? For me, it took almost 1 hour for the extension session. 3. How long it will stays? Normally it can stays for approximately 1 months, but it depends on how to take care of it. You still can wear eyes makeup, but the only thing that you have to be careful is don't forcefully wipe off your eyes makeup. You can use cotton buds to remove your eyes makeup so that you won't remove the lashes. And of course you cannot forcefully pull your lashes, it will drops if you pull it with force. And there's good news for you, who is reading my blog! 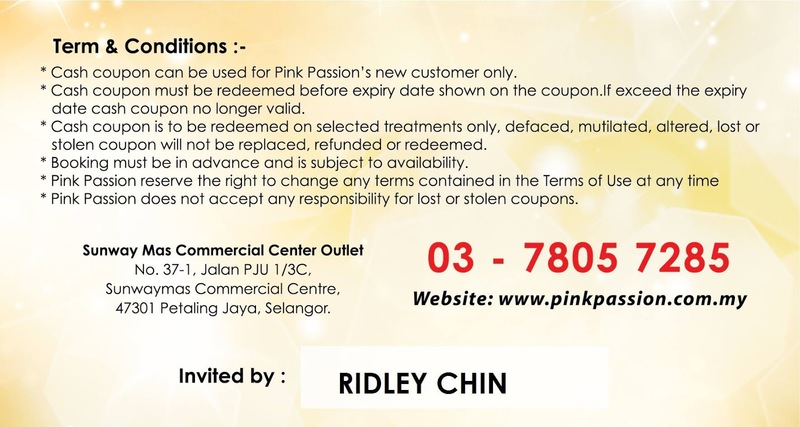 Thanks to Pink Passion, I will be giving out vouchers or e-vouchers for you all. 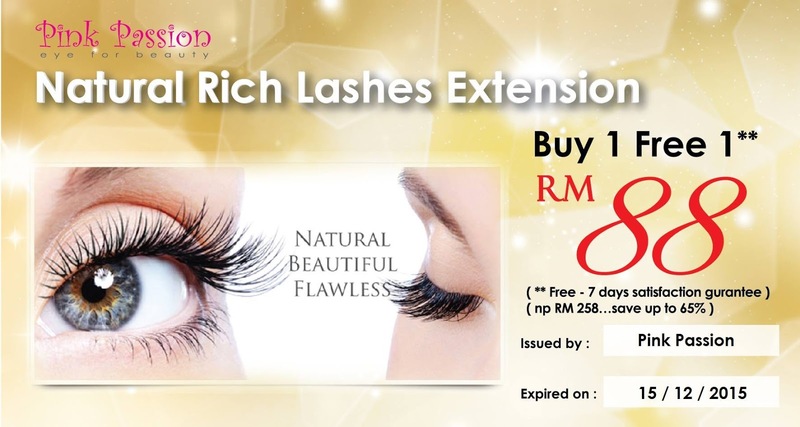 If you are their first time customer, by showing the voucher, you can get a Natural Rich Lashes Extension at RM 88 only! 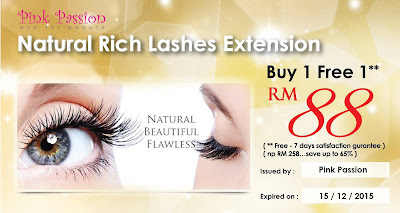 RM 88 will be including the lashes extension and free touch up altogether. 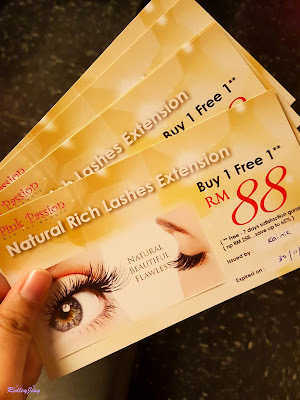 You can show them this e-voucher to get the lashes extension at RM 88.